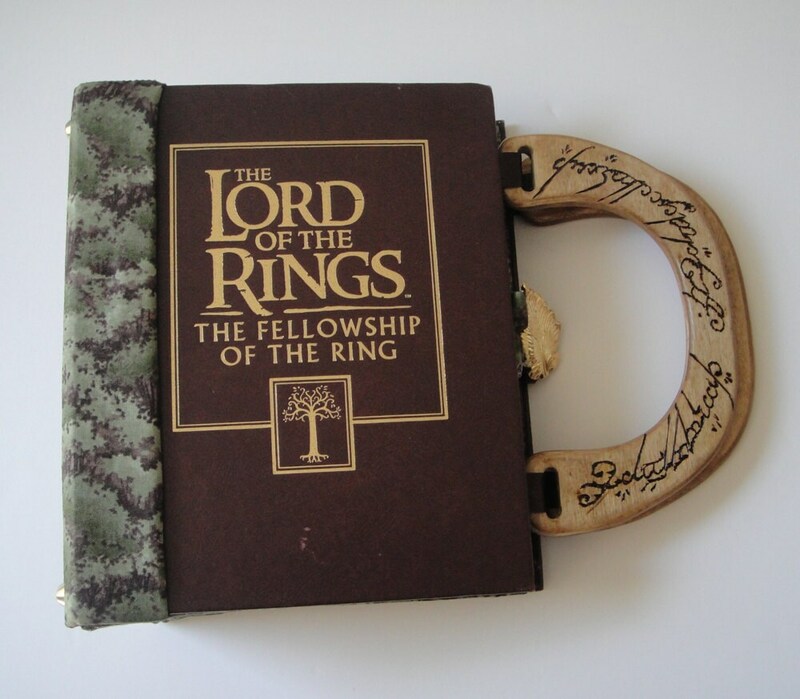 Since the beginning of my foray into book pursery, I have wanted to make a Lord of the Rings purse. I'm not a Tolkien fan (I fell asleep during the first chapter of The Hobbit) but I had the idea to make purse handles that resembled the "one ring." You know the one. The one Elijah Wood and the dude from Encino Man cried about for three movies? Three very, very long movies . . .
Hardcover copies of the "Ring" trilogy aren't easy to come by, especially those with cover art. 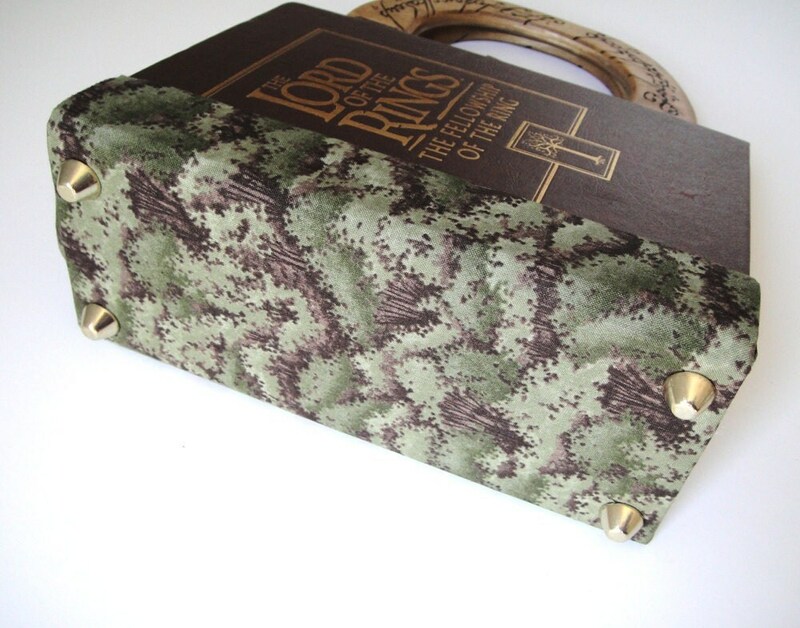 That is one difficulty with making book purses; a popular, classic hardcover book in good condition is hard to find because people want to keep those around! Finally, I found a used journal with LOTR cover art on Amazon.com. Unfortunately, the pages were blank. Though, someone with a Lord of the Rings journal probably doesn't have a very juicy love life. (Kidding! Kidding!) The cover art was clearly the logo from the movie but I liked it and knew others would as well. I had a JoAnn gift card left over from Christmas so I used it and a coupon to get a woodburning kit. I got one that included a woodburning pen, carbon paper and a couple of pieces of wood. I thought that was the best deal for my money but it wasn't. It was a really lame pen. It would get too hot too soon. So, if you're interested in woodburning (or pyrography-love that word! ), I would suggest spending more and buying a nicer pen (avoid the Walnut Grove brand). For lots of information about woodburning, check out this site. Even though I should've practiced extensively before I started on the handles, I jumped right in. I couldn't help it, I was excited! Burn, baby, burn! I think I did pretty well. The handles are obviously not perfect but I'm proud of them. I should mention the ridiculous amount of time it took me to find a decent copy of the writing on the ring. My hubby (who is a Photoshop expert) suggested I should download an Elvish font, type out the words and warp them into an arc in Photoshop. He said that would be the cleanest look. I tried that and it didn't look right. 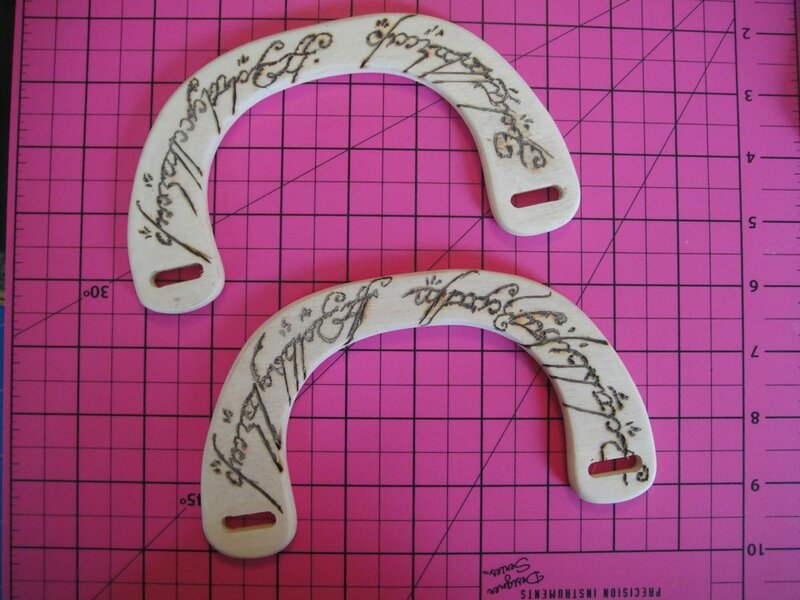 After lots of Googling (seriously, it this took me almost 2 hours) I finally learned that the writing wasn't in Elvish . . . it was in the black tongue of Mordor. Oh! Face palm. Everyone knows that. (Seriously, Tolkien?) Well, I looked for a font for it but (I shoulda guessed) there isn't one. It is the black tongue of Mordor after all . . . So, I did what I was originally planning to do: I found a graphic online, enlarged it in Photoshop and traced over it with carbon paper. It worked great. After I finished the burning, I sanded the handles and stained them (and sanded and stained and sanded and stained . . . ). I used a polyurethane and stain mix. After the several coats of stain dried, I treated the handles with a sealer. The rest of the purse came together beautifully. The fabric print is by Moda, featuring green treetops that reminded me of the Shire. I originally wanted a fabric with the map of Middle Earth on it. There is no such thing and to create such a thing would be super expensive and possibly get me into licensing trouble. So even though this fabric was a second choice, I really love how it blends with the book. 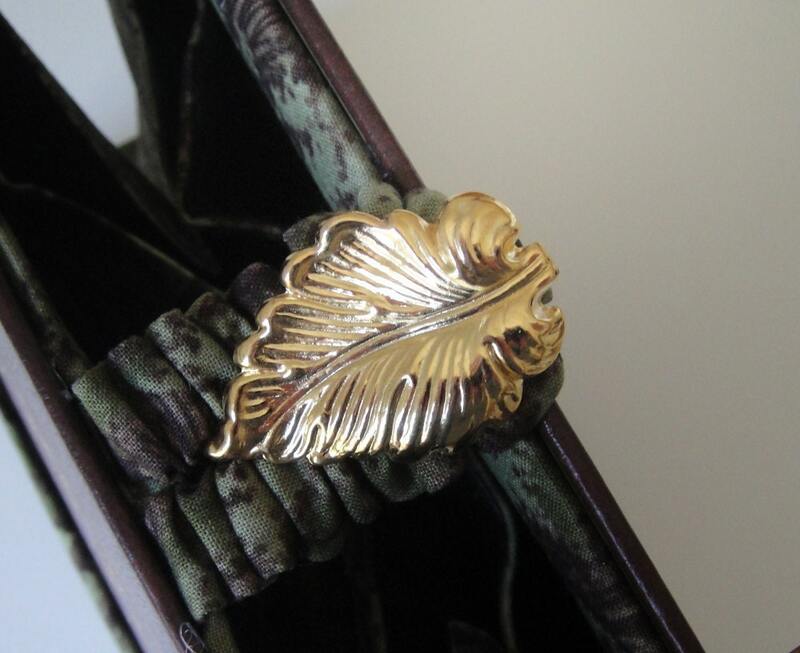 I used a brass stamping of a leaf for the button . . . it was the closest I could find to the leaves of Lorian. The whole purse has a very natural, woodsy feel. It's very unique, yet neutral. I feel like someone could carry this to work or school every day. I charged a lot for this purse because of the amount of time involved. I was nervous because I had never charged that much before. But . . . I sold this purse within a week of listing it! 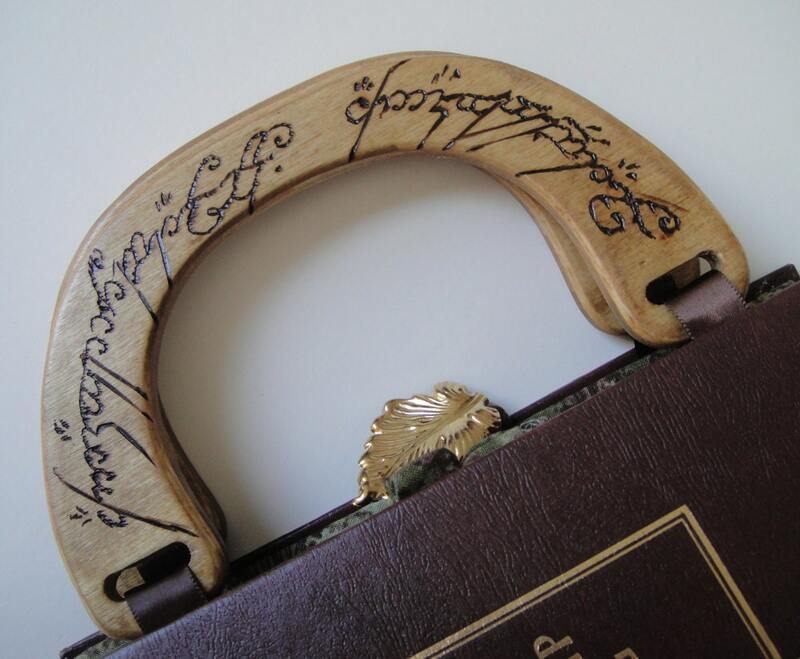 What did you think of my LOTR purse? 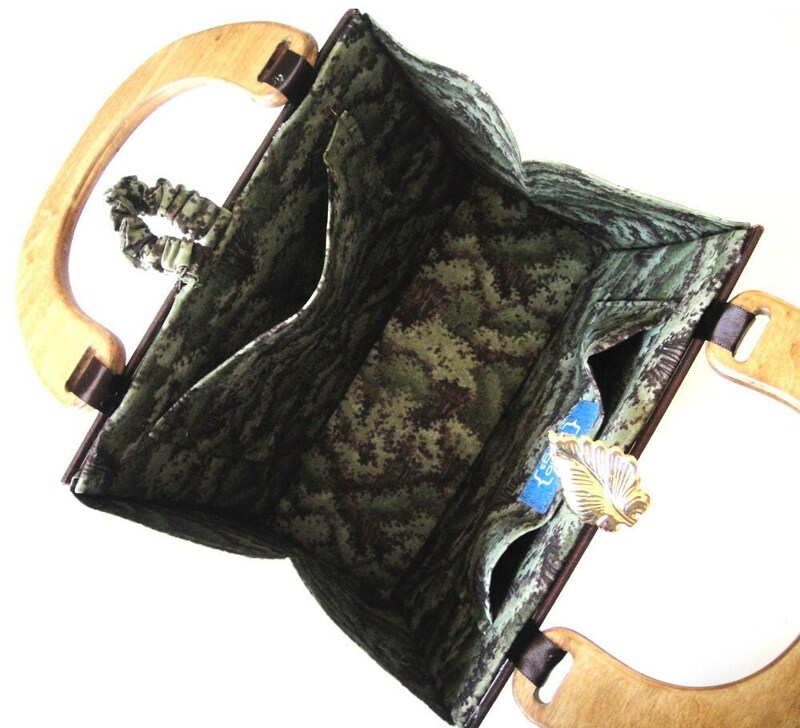 I love to hear feedback and suggestions for future purses. Okay, this is seriously awesome. I *am* a LOTR fan (both the books and the movies) and every detail of this is perfect. I especially appreciate the handles (all that work!) and the leaf clasp. So cool. LOVE! I suppose they could have hand painted it. Yikes.